Following the precedent set during the negotiations over Agenda 2030 and the Sustainable Development Goals (SDGs), the NUA has been hammered out over the last couple of years through a complex and often inclusive process. Important in this has been the Global Assembly of Partners as an umbrella for civil society, academia and ‘major groups’ such as regional and national governments. Although still only in semi-final form, the NUA is shaping up to be holistic and progressive in terms of the vision of urban sustainability that it embraces, stressing the importance of tackling urban poverty, promoting equity and justice, adapting to climate change including through transformative change and the like. However, the current version is long and general and lacks a clear relationship with the SDGs, especially Goal 11 on promoting sustainable and resilient cities, and mechanisms for implementation, monitoring and review/updating. Linked to the latter is the importance of having a global scientific research platform to provide authoritative independent evidence to inform the NUA and urban SDG’s implementation and review. Similarly, although the importance of regional and local governments is acknowledged, these sub-national institutions, which will necessarily play important roles in implementation and monitoring progress against the SDG targets and indicators, are accorded no formal position or role. It is vital that these shortcomings are addressed in the final version. The NUA and many other documents and policy papers contain brief but progressive characterisations of sustainable urban areas. Many research papers report detailed analysis of particular sectors or localities or individual towns and cities in terms of ambitious visions, climate change-related policies or specific interventions. Yet there is little substantive literature that takes a strategic overview of the key characteristics of sustainable cities based on reviews of the available literature. Accordingly my organisation, Mistra Urban Futures, an international research centre on urban sustainability based in Gothenburg (Sweden), have undertaken this task in a compact book, Rethinking Sustainable Cities. It is being published just ahead of Habitat III in order to help inform world leaders and other stakeholders at this critical juncture in the future of urban areas and hence prospects for overall sustainable development worldwide. Through the work we’ve identified three central characteristics of sustainable towns and cities everywhere which is that they are accessible, green and fair. Accessibility covers inclusion, equity and density – three characteristics that sometimes are used individually but most often with the overall objective of providing citizens true access to the city – not only in terms of having transportation from A to B, but also in the context physical, appropriate and affordable access. This amounts to being able to use cities’ social networks, opportunities and strengths for fulfilling one’s goals and dreams. Greenness encompasses far more than the conventional aesthetic concern with public open space and attractive trees and flower beds. It is a short-hand for comprehensive socio-ecological issues, including both the so-called ‘green’ and ‘brown’ (basic needs) development agendas, ecosystem services and about climate change adaptation, resilience and transformation, and urban health in the broadest sense. Fairness encapsulates equity and distributional issues, as well as including citizens in planning and knowledge production about the city they live in; acknowledging local knowledge, citizen-initiated inquiries and dialogues as legitimate formats for participation. ‘Fair’ also communicates a freedom from corruption and a legal system, including e.g. property development, that is consistent, predictable and appropriate. Although normative at one level, there is no global template and no ideal or universal balance among them. As with societal sustainable development as a whole, locally appropriate interpretation and implementation are essential. By providing a comprehensive analysis of these core attributes, this book should prove invaluable to everyone charged with formulating urban policy, implementing the NUA and the urban SDG as well as those researching and seeking to understand urban sustainability challenges. Rethinking sustainable cities edited by David Simon can be purchased here from the Policy Press website for special 20% discounted price £7.99. This book is Available Open Access under CC-BY-NC licence here. Edited and co-authored by David Simon, this volume in Policy Press’s Shorts series makes a signal contribution to the sustainable urbanisation agenda. 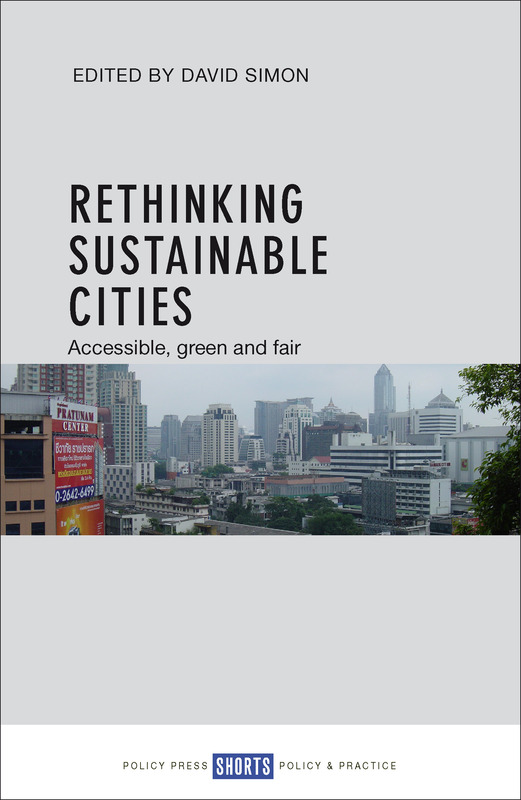 This it does through authoritative yet accessible essays contextualising, assessing and explaining clearly the relevance and importance of three central characteristics of sustainable towns and cities everywhere, namely that they should be accessible (James Waters), green (David Simon) and fair (Susan Parnell). The three thematic chapters survey the origins, evolution and diverse interpretations and applications of the respective terms in different contexts internationally and how they inform current debates and discourses. The concluding chapter (Henrietta Palmer and David Simon) pulls together the central strands of the book’s arguments and examines the implications for theory, policy and practice. Guides to relevant Internet resources and other resources make the book accessible for diverse policy, practice and academic users. Remember that Policy Press newsletter subscribers receive a 35% discount – if you’re not a member of our community why not sign up here today?